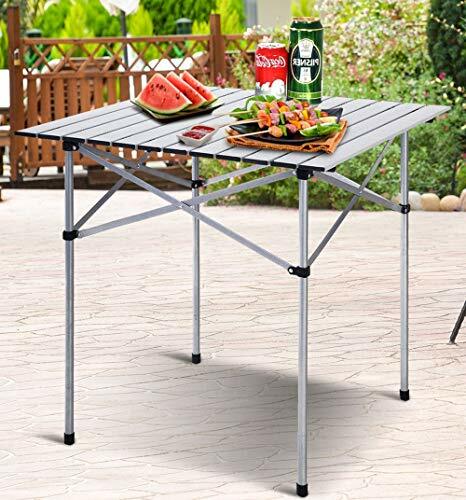 28" Square Portable Roll Up camping table, which is ideal for family reunions, picnics, camping trips, buffets or barbecues. The table is of aluminum table top and steel legs.So it resists spills and weather and sturdy easy to clean.Because of fully Rolling Up, it can saves space and time as well as convenient to transport and store. Smooth roll-up aluminum composite table top . Legs is foldable with non-skid rubber feet . Portable design with carry bag . Easy to clean top . Material:aluminum table top and steel legs . Overall Dimensions: 28" L x28" W x27 3/5" H .
Seating capacity: 4 . Weight capacity: 50 lbs. evenly distributed .